Edwin Hubble is perhaps most famous for discovering a relationship between the distance of a galaxy and the speed at which a galaxy moves away from us. This relation is now known as Hubble’s Law, and is evidence for the expansion of the universe. But Hubble’s primary interest was in galactic nebulae (what we now just call galaxies). Hubble was a consummate astronomer, and made some of the best galactic observations of his day. Over time he noticed that while galaxies could have all sorts of different shapes, they could be grouped into three large classes: ellipticals, spirals, and irregular. Hubble further organized galaxies into sub-categories, and in 1926 proposed a classification scheme known as the Hubble tuning fork. Hubble’s tuning fork diagram for galaxies. You can see this classification in the image here. You can see that starting with an almost spherical elliptical galaxy at the left, they get gradually flatter and disk-shaped, reaching s0, which is an almost uniform disk. These are also known as lenticular galaxies. Then the chart splits into spiral types above and barred spiral below. If this looks like a description of the evolution of galaxies, that’s understandable. Hubble recognized the transition from elliptical to spiral as a possible path of galactic evolution, but he cautioned readers not to make assumptions. We now know galaxies do not evolve from elliptical to spiral. 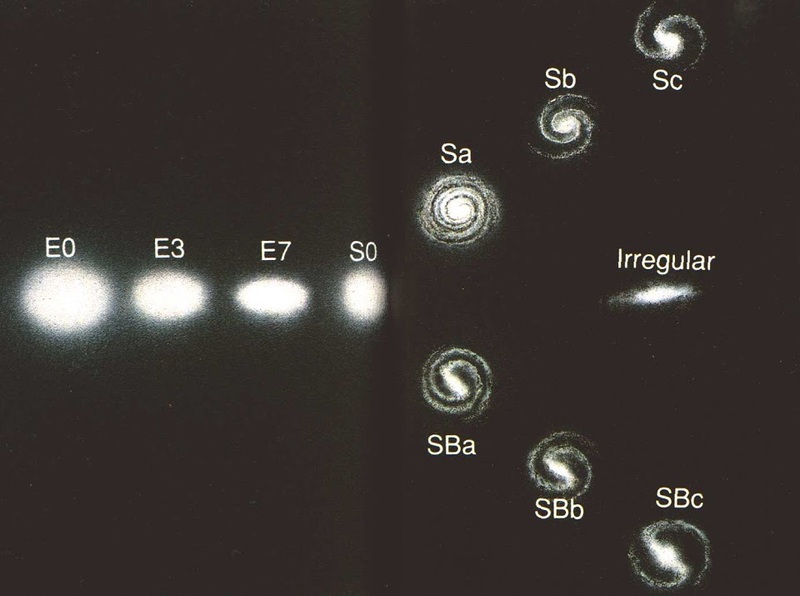 The most distant observed galaxies (and therefore the earliest galaxies) are primarily spirals and irregulars. 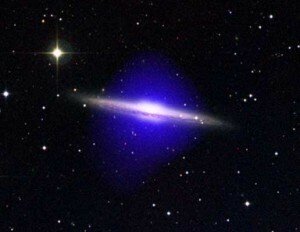 It is now thought that elliptical galaxies are the result of mergers between galaxies. Hubble’s tuning fork classification is still used today. As we have discovered more galaxies, and our observations of these galaxies have become more precise, we’ve found the categories are not a hard and fast rule. Determining exactly which into category a specific galaxy falls can be a bit of a judgement call. Still, knowing a galaxy’s classification is a good way to get a handle on its broad characteristics.